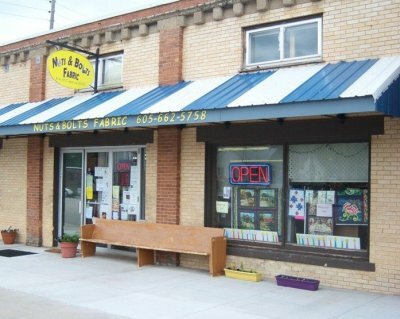 Our family owned and operated business started in 2005 as mixed vision of half quilt shop, half motorcycle repair with the name of Nuts (for the mechanic) and Bolts (for the quilter) Well, you can see what happened....being NUTS about BOLTS quickly overtook the entire family, resulting in the Nuts and Bolts Fabric Shop. We are located in the very southwestern corner of South Dakota among the beautiful Black Hills. Edgemont boosts the ONLY Hand built covered bridge in South Dakota. Follow this link to our Chamber of Commerce for more exciting things available in Edgemont. We have over 3000 bolts & pre-cuts of fabric in stock with more on the way. We carry patterns, books, notions, kits, GIFTS (hand crafted), long arm services, sewing machine service & classes available. We're also the home of the Porch Rabbit, makers of fleece hoods featuring Malden Mills Polar System Fleece. Our first building was a historic bank building here in downtown Edgemont, which we soon outgrew. Our new location, built in 1919, was the home of Reichardt Chevrolet. I guess the mechanics feel even more at home now....and yes, we do service sewing machines in what was the service department area of the old dealership. By the way, is your machine due for a tuneup? And dealerships, being built for room for autos, means room for important things like bolts, notions, batting, classes, sewing machines, book binding, long arm quilting and more. So if you're in the area, stop by and visit. We'd love to meet you!